Balham & Tooting Community Association have two events coming up in Wandsworth. Wednesday 23 October 6-8pm at 222 Upper Tooting Road, SW17 7EW. 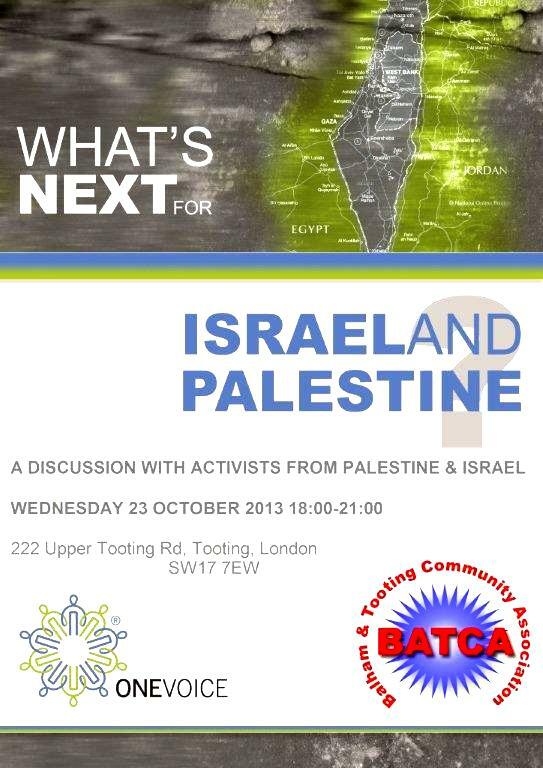 A joint event with One Voice, “What’s next for Palestine?” With activists from Israel and Palestine. Contact BATCA to add your name to the guest list. Thursday 28 November 7-10pm at 202 Upper Tooting Road London, SW17 7TG. The annual BATCA Community Celebration and Local Heroes Awards. Award nomination forms and (free) tickets for the event are available from BATCA. This entry was posted in Peace-building, Wandsworth and tagged BATCA by Catriona Robertson. Bookmark the permalink.